Have you ever found browsing through old post that something strikes a chord with you, even though it's your own words you are reading? I recently found something and I'm taking the liberty of re-posting it ... with the hope that you will enjoy seeing this re-run. I'll never forget the story I heard years ago of a fellow who was an artisan in his craft. He loved to bake bread. Because he wanted to work the dough himself, he could only produce a few dozen loaves in a day, and because he had time to be creative in his bread making, his bread became more and more popular. Pretty soon people were clamouring for him to expand his business. He kept saying no as that would mean taking his work into a whole different dimension. I didn't know the fellow but I felt bad for him, because here was someone doing what he loved, and doing only enough so he could still enjoy what he did. To take it to an assembly line would have taken the artistry out of his baking, and the joy of actually working the dough with his hands would have been traded for turning machinery buttons on and off. Some may call that progress, but is it? I like what Oscar Wilde says, "Every portrait that is painted with feeling is a portrait of the artist, not of the sitter." The artist here is the baker, and the portrait his loaf of bread. Maybe I'm being romantic, but perhaps that's why the customers were begging for more. Perhaps they felt the love this man poured into his baking. Every loaf unique, not exactly the same shape or even with the exact same ingredients, because he had the freedom to change his mind and add raisins without ruining a truckload of flour. You won't get that in mass production! Too often we live by other people's standards of what we need to do to feel productive. "Show me your piles of files in your outbox, and your stacks of bread, and I'll tell you if you've been productive or not. Let me see how much work you've accomplished and I'll judge how much to reward you." So what am I trying to say here? Mass production and creativity don't usually live on the same street. We may be tempted, even pushed into, doing more and making it bigger. But more is not always better. Not if the trade-off means loss of time for relationships, nurturing our own inner world, and sacrificing rest for bodies that are not machines. Not if we trade in our God-given creativity and the ability to be original and truly enjoy our work. There's an old wise saying, "When you eat the fruit of the labour of your hands, you shall be happy, and it shall be well with you." I look around me...sometimes I don't always get a whole lot accomplished in a day. I don't have neat stacks of finished files to show for my labour anymore. But for my efforts I may have a beautifully articulated article that will encourage my readers. I may have a friend who feels hopeful again because I spent an afternoon with her. Occasionally, I wonder what happened to that artisan-baker. I hope he never traded in his delight of working with his hands for an increase in production of his bread. I think everyone would have been disappointed in the end. Sometimes more is too much. So I'm learning to ask for Wisdom to know when to stop. bring you happiness and wellness today. 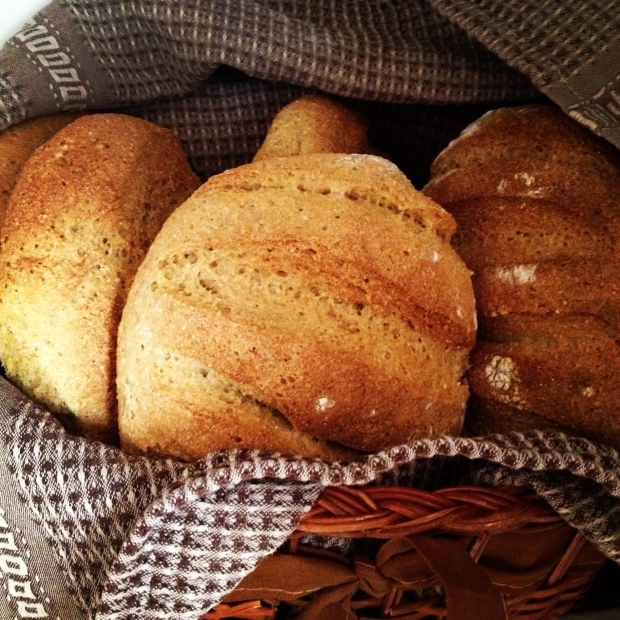 Nothing beats a loaf of freshly baked bread! I can almost smell it! Great ideas and very timefully. Have you thought about submitting it to a magazine to share with others. There's another phrase from Julia Cameron's books that goes along with this...Less is more. Ahhhh.... thanks for your comments, my blogging friends. I'm now set for the day. Lin, And thanks so much for the encouragement about submitting elsewhere. I really have to look for that book! Barb, I know, it's the most wonderful smell, isn't it! Hey Deb, good to hear from you! It takes a strong, secure person to pass up the siren song of money, but I bet that the artisan baker was able to do it. Some things are too important to make decisions primarily based on profit alone. Very profound, my friend.... beautiful, articulate, and packed with wisdom. I learned the hard way the folly of turning a theraputic, personally rewarding artistry into a business venture. The theraputic benefits were soon replaced with stress, the reward with disappointment. Lin's onto something here... This is an article more people should have the opportunity to glean from. What wonderful words of wisdom.